No- you’re not seeing double vision here, there’s actually 2 of these quirky pop tarts! The leading authority of online 3D gaming is back with a clash of culture like nothing else you’ve seen before! 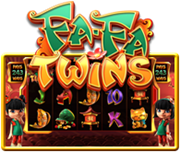 Introducing the fabulous Fa Fa Twins online slot from Betsoft that will certainly rock your online gaming slot world! There are just a few select words that could exactly describe this innovative Betsoft slot creation, however this is one slot game that really stands-out. Stepping aside from the traditionally designed casino-themed slot games, the Fa-Fa Twins 5-reel is actually one-of-a-kind taking into account the unique Anime theme -which is now hotter than ever before. This game is set in the Far East, far from the neon glow of Vegas. Nevertheless, it welcomes you to an exotic world of Japan where the Fa-Fa Twins come from. Dual reels means twice the chance to win? True to its tenets, Betsoft furnished Fa-Fa Twins with their realistic signature 3D environment. Pretty darn unique and ever-dazzling spin features kick off the game itself. Starting with 243 ways to win and a special dual reel feature adds more of the sweet than the sour when it comes to winning potential. How this works is simple- as there are reels which spin on each play, a dual and identical set will form somewhere in that instant. It can have an explosive effect of spreading to the neighboring reels further increasing a line win even more so. You might see a 3rd, 4th or 5th reel duplicated in a single spin and can offer up to 810,000 credits as a prize payout! Despite this mega win hoopla, what makes this free online slot stand out even further from similar slot games is the cool and gentle music you imagine Japan represents. It really plays-down the thought of anyone going nuts when you happen to win in such a manner. Are these kids worth wins in Fa-Fa Twins slot? While you can't wait to get your hands on these kinds of winning odds, aren't you curious if this free slot game is worth betting real money? Of course it is, but you better get plenty of free practice play first! After that, you can check out the selection of great sign up offers and bonuses offered by our responsible casino partners. Just like many other Betsoft games, this free online slot lets you place a minimum of 2 cents per coin bet with a maximum of 1 dollar. They even allow you a range of 1-5 coins per line wager. A max jackpot win yields as much as 1000x the line wager, yet with the Dual Reel function, you might be looking at a long-term win pattern that certainly adds up over time. Wanna bet you can clone your winnings? For those of you who think that each spin just leads to the next, wait until check out this. It seems that the Fa-Fa Twins has another trick up its sleeve. You can increase your chances of winning much more by flipping a coin! Sure it’s a bonus bet which lets you use 100% of your recent line win, or settle for just risking half of that amount. If you guess correct you double the amount! Another great way to clone this game is playing it on your mobile device. Give your pc a rest and try something more dynamic instead. Betsoft offers a solution called Slots 3 which allows mobile devices to duplicate the same game onto a specially formatted screen which works for all touchscreen smartphones. If you own iOS or Android mobile phones, or even Kindle fire or other internet friendly tablets, you can play instantly with no download. Try it today!